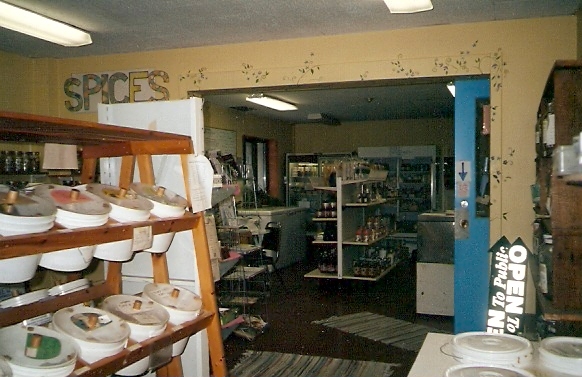 The Ebytown Food Co-op started off in 1971 as a buyer's club-- a small group of people collectively purchasing food in bulk. Until 1976, it operated solely on a pre-order basis. Members would make their orders one week, and pick up their purchases the next. This system was less convenient than a store system, but it had the advantages of requiring only a small amount of storage space, and tying up less money in inventory. The co-op has gone by the name Ebytown since our incorporation in 1978. (Ebytown was one of Kitchener's early names, after founder George Eby.) The co-op was located in the basement of the Global Community Centre on Queen Street South for about five years. In April of 1980, we moved to our second location at 225 Weber Street West. We finally had a store-front location and room for our expanding membership. In March of 1988, Ebytown moved to 280 Phillip Street, in the Waterloo Co-operative Residence, also known as WCRI. By special amendment to our corporate charter, the 800 current residents of WCRI were made Ebytown members. This location made it easier for us to reach out to the over 15 000 faculty, staff, and students on the UW campus, and to WLU folks as well. In August of 2006, Ebytown opened a store in the upper level of Your Kitchener Market in downtown Kitchener. The Phillip Street location stayed open as a store until the fall of 2007. Then it began to be used mainly for warehouse purposes with some member shopping. In May 2008, warehouse activities were moved to space that we had been given permisssion to use at Your Kitchener Market. The Phillip Street location was closed. In the Fall of 2008, Ebytown lost its store at Your Kitchener Market. The Market was reorganizing and had other plans. Ebytown now operates as a buying club, utilizing space provided at The Working Centre (43 Queen Street South, Kitchener).